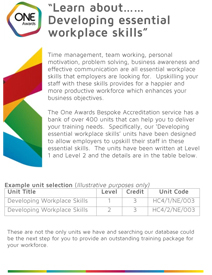 The two new units have been developed at Level 1 and Level 2 and are called 'Developing Workplace Skills'. They have been specifically designed to allow employers to tailor make the training they offer bespoke to their situation whilst also enabling accreditation to be awarded for measurable learning outcomes. These are exciting new units and ones you should not miss! For more information please contact us 0191 5186550 or admin@oneawards.org.uk.